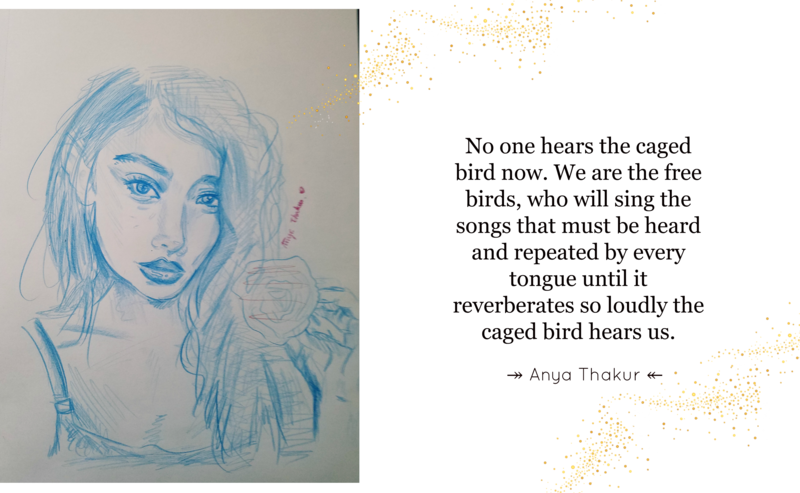 “Crises Unseen” is a poem written by teen activist, artist, and journalist Anya Thakur on the power of youth to create change and to build empathy across borders. With the crises faced by many refugees and the hardships endured by immigrants and their families, I went into my community to offer aide and help to uplift and ease their journeys. From the streets of downtown Dallas to shelters and supply stores to high schools in my neighborhood, I discussed with immigrants and dreamers, and joined teenagers in Frisco and Plano to help in providing donations, resources and services, and hot meals. Beyond directly affecting these families, I wanted to share their stories in the hopes that they affect and inspire others. Storytelling is an important art that deserves to be celebrated. But beyond words, we need change-makers and I aim to give greater purpose to my art by using my voice and my platform as a vehicle to help build empathy across borders and invoke action. The following piece is inspired by the conversations I had and the incredible people I was privileged to meet. Why lock up birds in cages? Take the eggs and let them be born in captivity, never knowing freedom. They are too young to understand, and to resist. I have heard the words lockdown and cages too many times in the past few days. They’re not words I’d typically associate with children or the United States, but here we are. I remember brushing my mom’s makeup onto my dolls, unearthing plastic gemstones from the sandbox, and learning the alphabet with the names of dinosaurs. Now, children may have to pass through metal detectors and their parents’ immigration status is discussed at the dinner table. As a child, I am small and though I may not see myself that way, highly vulnerable. I am also very powerful, though others may not see me that way. I am scared for schoolchildren, of potential gun violence, of mental health issues left unaddressed, and scared because they are scared of being children and going to school. This fear has also made me more powerful, as I spring to action, raising awareness for the plight of children through my words, laced with both bravery and trepidation. I am not afraid when I know what I am doing is right. We think. Of Parkland. Border security. Metal detectors. SB3036. Policy. Thoughts and prayers. They think. Of exits. Concealed handguns drawn. Police officers. Asylum. ICE agents. Food. Water. But our words are many times all we feel we have to offer. Condolences are a start, never a solution. Offer your love and deepest sorrow, then make sure you never have to give it again, to feel powerless and helpless when confronted with such loss. Words can be a way to heal, rosewater and ointment on a wound. They can also be the salt that stings raw flesh. And ointment and rose petals cannot fill bullet holes. Tears cannot save our children. Trade your salt for sugar. Political parties, disparities, and rivalries cannot blindside us from effective and meaningful change. Protect our country, and protect our people. But with humanity and dignity, with humane policy, and do. our. young. proud. No one hears the caged bird now. We are the free birds, who will sing the songs that must be heard and repeated by every tongue until it reverberates so loudly the caged bird hears us. Yes, these are all my pieces. Hope you enjoy!